I’ve been getting a lot of questions lately from people who want to specify which tab visitors land on in their Facebook Fan Page. And understanbly so, because this is a very cool feature for Facebook Fan Pages, and allows some element of customization and “character” to your Pages. 1) Make sure you’re logged in to Facebook as the admin (owner, creator, etc…) of the Facebook Fan Page you want to work with. 2) Go to the Facebook Fan Page you want to edit. 6) Click the drop down menu to the right of “Default Landing Tab for Everyone Else“, and select the tab you desire. *** Setting a custom tab here applies only to those who are not yet fans of your Facebook. 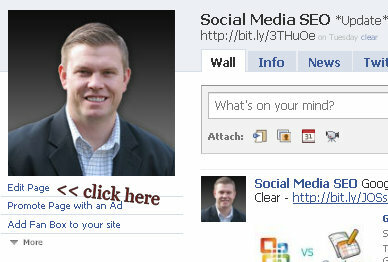 For current Fans of your Facebook Page, the default landing tab is the wall, and that is something that cannot be altered. I can not find my wall settings, can u help me pls ?